The DIR-500 is a device built to meet the need to repack bulk produced dry ice into smaller doses of dry ice/nuggets (up to 16 mm) for your target market. The first DIR-500 was built in 2012 due to increasing demands of the market. CRYONOMIC® is the first one in Europe that offers a complete range of dry ice blasting equipment, dry ice production machines, dry ice containers and dry ice repacker! 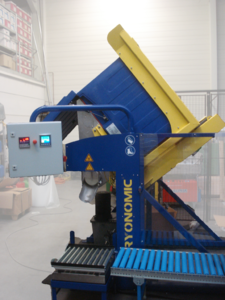 This machine replaces the heavy job of manually filling! An integrated balance weights the actual weight during filling and shows it on the touch screen. Filling stops if the programmed weight is reached. While the machine is filling a box, the operator has the time to close and label the filled box. Why to choose for the CRYONOMIC® Dry ice repacker? Questions or more information required about the product 'DIR-500'?